The most powerful system for sales success—from the author of the bestselling audiobook, The Psychology of Selling. Strategy, tactics, and mental preparedness separate superior salespeople from the average—and with technological advances evening the competition, the selling edge is now more important than ever. Drawing on his own successful sales career and on his extensive experience as a sales consultant and seminar leader, Brian Tracy has developed the most comprehensive and effective approach to selling ever created. 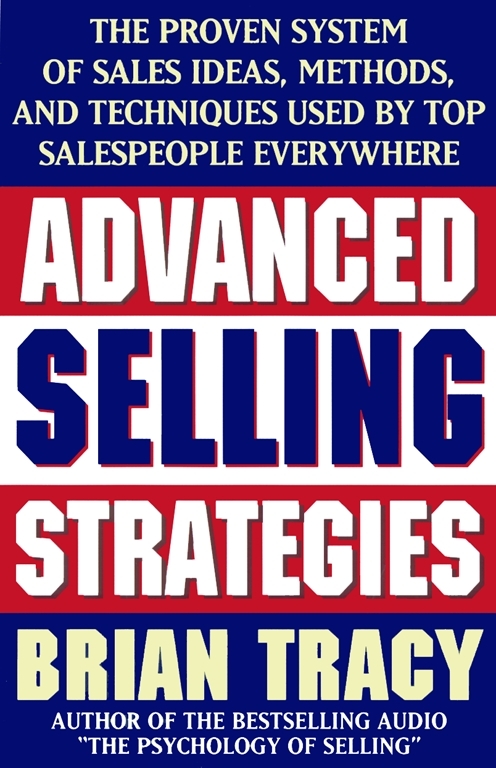 A MUST READ FOR SALESPEOPLE AND BUSINESSPEOPLE ALIKE. Some salespeople always do well, no matter what is happening around them. They make excellent money, live in nice homes, drive new cars, and dine in fine restaurants. They always seem to have money in their pockets and in their bank accounts. Most of all, they are happy, optimistic, positive, friendly, relaxed, and seem to be in complete control of themselves and their lives. They are the top salespeople in every organization and their companies are dependent upon them for continued sales results. Thousands of hours and millions of dollars have been spent studying the most successful salespeople in our society. They have been interviewed exhaustively, as have their customers, co-workers, and managers. Today as a result of this research, we know more about what it takes for you to be one of the best in your business than we have ever known before. And the most important thing we have learned in all these studies is that selling is more psychological than anything else. One of the most important principles ever discovered in the field of human performance is called the "winning edge concept." This concept states that "small differences in ability can translate into enormous differences in results." What this means is that if you become just a little bit better in certain critical areas of selling, this slight improvement can translate into a substantial increase in your sales results. You may be on the verge of a major breakthrough in your sales career at this very moment by lust learning and practicing one small thing that is new and different from what you have done before. If a racehorse comes in first, even by a nose, it wins ten times the prize money of the horse that comes in second. Does this mean that the horse that wins by a nose is ten times faster than the horse that comes in second? Of course not! Is the horse that wins by a nose twice as fast, or 50 percent faster, or even 10 percent faster? The horse that wins is only a nose faster, but that translates into ten times the prize money. By the same token, the salesperson who gets the sale for himself and his company gets 100 percent of the business and 100 percent of the commission. Does this mean that his product is 100 percent better than that of the competition, or 100 percent cheaper? Of course not! His product may not even be as good and it may cost more than that of the competitor, but the top salesman gets the sale nonetheless. The person who gets the sale is, in most cases, not a lot better than the person who loses the sale. He or she merely has the winning edge, but that's all it takes to get 100 percent of the business. This concept is vital to your success. You may have heard of the Pareto Principle, the 80/20 rule, which, as it applies to sales, says that 80 percent of sales are made by 20 percent of the salespeople. Depending upon the sophistication of the industry and the overall level of training, the ratio can be 90/10 or 70/30, but in large national sales forces, the 80/20 rule holds true. Twenty percent of the salespeople make 80 percent of the sales and earn 80 percent of the commissions, while 80 percent of the salespeople make only 20 percent of the sales and share only 20 percent of the commissions. What this means in dollar terms is remarkable! If ten salespeople are making a total of $1 million in sales in a given period, this means that two of the salespeople are making $800,000 of sales or approximately $400,000 each, and eight of the salespeople are making $200,000 of sales, or $25,000 each on average. This is a ratio of 16 to 1. The top salespeople are outselling the bottom salespeople by sixteen times! This difference in sales results cannot be explained simply by sales technique and methodology. There is something else going on, and that something else is the mind-set or psychological state of the salesperson. In every large company, it is common for some salespeople to be earning $25,000 a year while other salespeople are earning $250,000 a year, a difference of ten times. They are all selling the same product, to the same people, at the same price, under the same competitive conditions, into the same market, and out of the same office. Is the person earning ten times as much as the other working ten times as hard, putting in ten times the number of hours? Does he or she see ten times the number of prospects? Is it possible for the high-earning salesperson to be ten times better, in any area, than the person earning one tenth as much? Of course not. In fact, sometimes the person earning ten times as much as the other salesperson in the office is younger, has less education, sees fewer people, works fewer hours, and has less experience than the long-term professional who is barely making a living. This book will show you how to move into that top 10 percent of salespeople, to become one of the highest paid people in America, and to achieve all of your goals and dreams in this wonderful profession. And this requires, more than anything else, that you develop the winning psychological edge, which we will talk about through the rest of this chapter. The 80/20 rule is as applicable to individual salespeople as it is to large sales forces. Fully 80 percent of your success as a salesperson will be determined by your attitude and only 20 percent by your aptitude. A positive mental attitude, or a constructive and optimistic way of looking at yourself and your work, goes hand in hand with sales success in every field and in every market. Developing this attitude of unshakable self-confidence and enthusiasm, no matter what is going on around you, is your passport to greatness in selling. The 20 percent of sales effectiveness that comes from product knowledge and professional selling skills is extremely important as well. It is only when you are thoroughly knowledgeable about what you are selling and thoroughly skilled in your ability to present it effectively that you develop the confidence and self-assurance upon which a positive mental attitude depends. We will talk more about this in later chapters, but for now, let's continue our discussion of attitude. The quality of your thinking determines the quality of your life. If you improve the quality of your thinking, in any area, you will improve the quality of your life in that area. By using your mind, your ability to think, you take charge of your life and determine your own destiny. You move from being powerless to being powerful. You determine everything that happens to you by the way you think about it, in advance. You may not be what you think you are, but what you think, you are! The most rapid and positive changes in your personality and your sales results come about when you change your thinking about yourself and your possibilities. When you reprogram your subconscious mind so you feel a sense of personal power and control, every part of your life begins improving immediately. As William James of Harvard wrote in 1905, "The greatest revolution of my generation is the discovery that individuals, by changing their inner attitudes of mind, can change the outer aspects of their lives." The very best salespeople have an attitude of calm, confident, positive self-expectation. They feel good about themselves and they have a quiet faith that everything they are doing is contributing toward their inevitable success. They are relaxed about their lives and their careers. They know, in their hearts, that they are good at what they do, and their customers know it as well. Often, their customers decide to buy from them even before they've made a sales presentation or described their product or service. They are the champions of selling everywhere. And because of the Law of Cause and Effect, you can become one of them by developing the same attitudes and attributes that they have. One of the greatest breakthroughs in human performance and effectiveness in the twentieth century is the discovery of the self-concept. Your self-concept is the bundle of beliefs that you have about yourself and your world. It is the master program of your subconscious computer. These beliefs began forming with your very first experiences as an infant. Over the years, you have absorbed a complex series interwoven ideas, doubts, fears, opinions, attitudes, values, expectations, hopes, phobias, myths, and other impressions. You have taken them into your mind and accepted them as true. These are the operating instructions of your subconscious computer and they control everything that you say, do, think, and feel. In the absence of any deliberate change on your part, you will continue doing, thinking, saying, and feeling very much the same things indefinitely. Just as you have an overall self-concept, or composite idea of who you are and what you can do, you also have a mini-self-concept for each individual part of your life. These mini-self-concepts determine how you think, feel, and perform with regard to people, sports, health, relationships, work, learning, creativity, and everything else you do. You have a mini-self-concept for how much money you earn, as well. Whether or not you are happy with your income, it is the amount you have programmed yourself to earn, based on your past earnings and your current belief system. It is your self-concept level of income. It is the cumulative total of all your experiences with earning money since you got your first job. It is a part of your subconscious programming, and you tend to earn that amount even if you change jobs or move to another city. It is locked in. In fact, this self-concept level of income is so deeply ingrained that if you earn much more or less than your current level of income, you will feel distinctly uncomfortable. Even thinking about earning substantially more or less than you're accustomed to will make you uneasy. For example, if you earn 10 percent or more above this level, you will do everything possible to get rid of the money. You will have an irresistible urge to go out and spend it, even splurge on buying something you don't need. If you earn more than you're comfortable with for any period of time, you will feel impelled to invest in things you know nothing about, lend it to people who won't pay it back, or even give it away. If you earn less than your self-concept level of income, you will start engaging in scrambling behaviors to get your income back up into the range where you feel comfortable. You will start working longer and harder, and maybe upgrading your skills. You may consider second income opportunities, starting your own business, or think about getting a new job where you can earn more. Any change, or even an attempt to change anything you are doing, makes you uncomfortable. By attempting to change, you move out of your comfort zone. You feel increasingly uneasy. You experience stress and tension. If the change is too extreme, your physical and mental health can be affected. You will experience sleeplessness, indigestion, or fatigue. You may react with impatience, irritability or anger. You will often feel as if you are on an emotional roller coaster. So if you want to sell more and earn more, you must increase your self-concept level of income. You must increase the amount you believe yourself capable of earning. You must raise your aspirations, set higher goals, and make detailed plans to achieve them. You must begin to see yourself and think about yourself as capable of being one of the highest earning salespeople in your field. You must take charge of developing a new self-concept for sales and income that is more consistent with what you really want to accomplish. Your self-concept determines your levels of performance and effectiveness in everything you do. In sales, you have mini-self-concepts that govern every activity of selling. You have mini-self-concepts for prospecting, for cold calling, for making appointments, for presenting, for closing, for getting referrals, and for making follow-up sales. You have a mini-self-concept for your level of product knowledge, your personal management skills, your level of motivation, and for the way you relate to different types of customers. In every case, you will always perform in a manner consistent with the way you see yourself. Wherever you have a high self-concept, you perform well. If you enjoy working on the telephone, you look forward to telephone prospecting and selling, and you do it well. If you have a high self-concept for making presentations or for closing sales, you feel comfortable and competent whenever you are doing them. Wherever you feel tense or uneasy in selling, it means that you have a low self-concept in that area. You do not feel comfortable when you are engaged in that activity. You probably avoid that activity as much as possible. If you are not particularly skilled at a particular activity, you will feel uncomfortable at the very thought of it. If you are not good on the telephone, you will avoid the telephone as much as possible. If you are not good at prospecting, you will avoid prospecting as much as possible. If you are not good at confirming the sale and closing the order, you will choke up at the end of the sales presentation and avoid asking for a commitment from the prospect. In each case, your income and your sales will suffer until you decide to change. Some years ago, a young man in one of my seminars told me how moving out of his comfort zone was affecting him. He had come from a small farming community and he was selling large, expensive satellite dishes to wealthy farmers who had just had an excellent harvest. The winter was coming and they wanted television during the cold months ahead. The satellite dishes were new at the time and popular, and he was selling two a week, earning $1,000 commission on each one. He told me that he had never made so much money in his whole life. His problem was that, after his second sale of the week, he experienced a form of withdrawal, accompanied by a desire to flee. He said that he was so overwhelmed by the amount of money he was making that he would go home after the week's second sale, close all the blinds in his bedroom, and lie on his bed in the darkness for several hours. This was his comfort zone. Whenever you feel any kind of stress in selling, your natural tendency will also be to return to your comfort zone, at a lower level of performance, rather than to continue at what you're doing until you feel comfortable at that new level. Sometimes this discomfort, which can lead to self-sabotage, is mislabeled the "fear of success." But what it really is is the experience of attempting to achieve at a level beyond what you really believe is possible for you. It is no surprise, then, that the top salespeople have high self-concepts in every phase of the selling process. They make most of the money that is paid in the sales profession. They are the most respected and esteemed people within their organizations and by the customers they call on. Their high, positive self-concepts for selling translate into excellent sales results and great lives for themselves and their families. Your self-concept is made up of three parts, each of which affects the others. When you understand the roles of these three aspects of your mental makeup, you can then put your hands on the keyboard of your own mental computer and change your programming. When you learn how to create a new and better self-concept of yourself as a salesperson, you can then control your sales results for the rest of your career. The first part of your self-concept is your self-ideal. Your self-ideal largely determines the direction of your life. It guides the growth and evolution of your character and personality. Your self-ideal is a combination of all the qualities and attributes of other people that you most admire. It is a description of the person you would most like to be if you could embody the qualities that you most aspire to. Throughout your life, you have seen and read about people who demonstrated the qualities of courage, confidence, compassion, love, fortitude, perseverance, patience, forgiveness, and integrity. Over time, these qualities have formed in you an ideal, or vision, of the very best person you or anyone could possibly become. You may not always live up to the very best that you know, but you are constantly striving, even at a subconscious level, to be more like the kind of person you most admire. In fact, in almost everything you do, you are comparing your activities with these ideal qualities, and you strive continually to behave consistent with them. Successful salespeople have very clear ideals for themselves and their careers. Unsuccessful salespeople have only fuzzy ideals, if they have any ideals at all. Successful salespeople are clear about wanting to excel in every part of their work and their personal lives. Unsuccessful salespeople don't give the subject very much thought. One of the primary characteristics of successful men and women in every walk of life is that they think continually about whether or not their current behaviors are consistent with their idealized behaviors. Part of your ideals are your goals. As you set higher and more challenging goals for yourself, your self-ideal improves. When you set clear goals for the kind of person you want to be and the kind of life you want to live, your self-ideal becomes a greater guiding and motivating force in your life. Perhaps the most important part of developing your self-ideal is for you to realize that whatever anyone else has done or become, you can do or become as well. Improvements in your self-ideal begin in your imagination, and in your imagination there are no limits except the ones that you accept. What is your ideal vision of the very best person you could possibly become? How would you behave each day if you were already that person? Asking yourself these questions and then living your life consistent with the answers is the first step to creating yourself in your ideal image. The second part of your self-concept is your self-image. Your self-image is the way you see yourself and think about yourself in the present. It is often called your "inner mirror." You constantly refer to this mirror to see how you should perform or behave in a particular situation. You always behave on the outside in a manner consistent with the picture you have of yourself on the inside. For example, when you see yourself as calm, confident, and competent in any aspect of selling, whenever you are engaged in that activity, you will feel calm, confident, and competent. You will be positive and happy. You will perform well and get excellent results. If, for any reason, it doesn't go well at that time, you will throw it off and dismiss it as a temporary situation. Your self-image is clear. In your mind's eye you see yourself as good and capable in that area, and nothing can disturb your mental picture. The most rapid improvements in sales results come from changing your self-image. The moment you see yourself differently, you behave differently. When you behave differently, you feel different. And because you are behaving and feeling differently, you get different results. Some years ago, when I was selling discount club memberships, I would end my presentation by giving the prospect a booklet outlining the membership benefits and encourage him to "think about it." My self-image was such that I could not bring myself to ask the prospect to make a buying decision. All day long, I would go from office to office giving my presentation and leaving a little booklet for the prospect to read. And as you might imagine, I was not making any sales. When I called people back after they had time to think about it, they would invariably say they were not interested. I was getting desperate. I was living from hand to mouth at the time. Although I was seeing lots of prospects, I was making very few sales. Then I had a revelation that changed my career at the time. I realized that it was my fear of asking for the order that was causing all my problems. It was not my prospects. It was me. I needed to change my self-image and thereby change my behavior if I wanted my results to improve. The very next morning, I made the decision that I would not call back on a prospect. The size of the purchase was small and, when I had completed my presentation, the prospect would know everything that he needed to know to make a decision. There was no benefit or advantage to leaving material behind or giving the prospect several days to think about it. At my very first call, when I had finished my presentation, the prospect said, "Let me think it over." This time I was ready. I smiled and told him politely that I did not make callbacks because I was too busy making sales to other customers. I then said, "You know everything you need to know to make a decision right now. Why don't you just take it?" I remember him shrugging his shoulders and saying, "Okay. I'll take it. How would you like to be paid?" I walked out of that office on a cloud. That very day I tripled my sales. That week, I sold more than anyone else in the company. By the end of the month, I had been promoted to the position of sales manager with forty-two people under me. I went from making one or two sales a week to making ten to fifteen. I went from worrying about money constantly to earning a large salary with an override on the activities of all my salespeople. My sales life took off and, with few exceptions, it never stopped. And the turning point was my decision to change my self-image and make it more consistent with the results I wanted rather than the results that I was getting. The third part of your self-concept is your self-esteem. This is the emotional component of your self-concept. It is the "reactor core" or energy source of your inner power. It is the most important single element determining your attitude and your personality. It is the key to your success in life. Your self-esteem is best defined as how much you like yourself. The more you like yourself, accept yourself, and respect yourself as a valuable and worthwhile person, the higher your self-esteem. The more that you genuinely feel you are an excellent human being, the more positive and happy you are. Your self-esteem determines your levels of energy, enthusiasm, and self-motivation. Your self-esteem is the control valve on your performance and your effectiveness. Your self-esteem is like the fuel in a rocket that blasts it free of the earth's gravity and into orbit. People with high self-esteem have tremendous personal power and do well at just about everything they attempt. Your self-ideal is the person you most want to be, sometime in the future. Your self-ideal determines the direction of your life, of your growth and evolution as a person. Your self-image, on the other hand, determines the way you perform in the present. Your self-image is the way you see yourself now, today, at this moment. Your self-esteem is largely determined by the relationship between your self-image and your self-ideal, or the way you are performing in your day-to-day activities compared with the way you would be performing if you were the very best person you could possibly be. The more that your day-to-day activities are consistent with the person you want to become, the higher will be your self-esteem. If your ideal is to be well organized, calm, positive, and working progressively toward the achievement of your goals, and in reality you are behaving in a well-organized, calm, positive manner, working step by step toward your objectives, you will have a high level of self-esteem. You will like and respect yourself. You will feel happy, healthy, and optimistic. You will be a high-performance personality. Self-esteem is the foundation of a positive self-concept. High self-esteem is the critical element in sales success. The more you like and respect yourself, the better you perform at everything you do. Developing and maintaining high levels of self-esteem is the most important thing you can do, every day, in building yourself to the point where you are capable of achieving all your goals. High self-esteem goes hand in hand with great sales success. By the same token, the major cause of sales failure is low self-esteem. Low self-esteem translates into feelings of inferiority, unworthiness, and undeservingness. It is manifested in feelings of incompetence and inadequacy. Low self-esteem is a feeling of not being good enough. Low self-esteem is comparing yourself negatively with others, ascribing greater qualities to them than they have, and ascribing to yourself lesser capabilities than you possess. Low self-esteem is seeing the glass as half empty rather than half full. Low self-esteem leads to stress, negativity, pessimism, fearfulness, self-doubt, and the tendency to sell yourself short in almost every situation. In sales, the negative effects of low self-esteem are experienced in the fear of rejection. The fear of rejection is the biggest single obstacle to success in selling. It is the fear of rejection that, more than anything else, holds you back from achieving your full potential. It is the fear of rejection that causes you to settle for far less than you deserve. It is the fear of rejection that causes you to hold back from seeing more and better prospects, and from translating those calls into more and better sales. It is the fear of rejection that acts as the brake on your potential for greatness in the field of sales. And it is the fear of rejection that you must eliminate if you are going to go all the way to the top in your field. The one good thing about the fear of rejection is that it is an acquired fear. No one is born with it. It is learned through a process of conditioning from early infancy onward. It is a negative habit pattern that almost everyone develops during the process of growing up. And because it is a learned condition, it can be unlearned as well, and sometimes quite quickly. When you were born, you had no fears at all except for two: the fear of falling and the fear of loud noises. Every fear that you have today had to be taught to you by your parents, siblings, and others through repetition and reinforcement as you grew up. Your fears are all learned. The fear of rejection or disapproval is based on "conditional love." Conditional love occurs, for example, when one or both parents make their love and support conditional upon your behaving in a certain way. At an early age, you learned that if you didn't do what Mommy or Daddy expected of you, they would withdraw their love and approval. They would be angry and negative. They would use destructive criticism and even physical punishment on you to get you to do what they wanted you to do. As you grew up, your self-image, the way you see yourself and think about yourself, became more and more dependent upon the way you thought others saw you and thought about you. You might even have become hypersensitive to the way people treated you and talked to you. You may have started adjusting your behaviors to get other people to like you, respect you, and approve of you. You started down the slippery slope of compromising your own uniqueness in an attempt to gain the respect and esteem of others. To a greater or lesser degree, we all have fears and concerns about how other people think about us. Adults with low self-esteem are extremely sensitive to the opinions of others, often to the point where they cannot make a decision without getting the approval of someone else. A husband will not make a buying decision without getting the approval of his wife, or a wife will not make a buying decision without getting the approval of her husband. Grown children will not make buying decisions without getting the approval of their parents. People will not buy things without asking their friends, lawyers, accountants, or advisors. In business, people will not make decisions without referring the entire matter to one or more other people to gain their approval. In sales, the fear of rejection manifests itself in a fear of calling on strangers. It is at the root of the reluctance you feel to seek out new prospects for your product or service. Fear of rejection causes stress, anxiety, and even depression. It paralyzes prospecting behavior and undermines a salesperson's effectiveness at every stage of the process. Fear of rejection is the primary reason that so many people drop out of sales, blaming the company and the management, and then take jobs earning far less than they could be. This fear of rejection can manifest itself in different ways, and not all salespeople are subject to the exact same fears. For example, low self-esteem, and feelings of inferiority leading to the fear of rejection, make some salespeople tense and uneasy about calling on prospects who they feel are better than they are socially or economically. These salespeople will not call on senior executives or professional people because they don't feel good enough. An older salesman was telling me recently about several people he had gone to school with who were now senior executives in major corporations. He was proud of his friendships with these people, which he had maintained over the years. I then asked him how many of them were customers of his. The answer was none. His particular type of call reluctance was holding him back from approaching them even though he knew they were buying large quantities of the services he sold from other companies. Many salespeople are afraid to sell to their friends and associates for fear that they will disapprove of them or be critical of their career choices. Sometimes, salespeople are ashamed of being in sales in the first place, and as a result they are afraid to approach almost anyone they know to offer their products or services. The most common fear of rejection is that associated with approaching strangers, people that you don't know and who you have never spoken to in the past. This generalized fear of disapproval is the greatest destroyer of promising sales careers. It is the fear that a person will say something unkind or "I'm not interested." The starting point of overcoming the fear of rejection is to realize this: rejection is not personal. Rejection has nothing to do with you as a person. The prospect does not know you well enough to reject you as an individual. The rejection is only associated with the situation and personality of the prospect, and has nothing to do with your personality, integrity, and competence. To repeat: rejection is simply not personal. It is a standard reaction to almost any sales proposal in a commercial society. Some of your very best customers will be people who responded negatively to your first approach. This is to be expected. The average American is bombarded by hundreds of commercial messages every single day. Television, radio, newspapers, magazines, mail, and telephones are filled with solicitations for products and services. The prospect's initial reaction to you, even if he wants and needs the product you sell, because of message overload, will almost invariably be negative. Prospective customers are busy, if not overwhelmed, with their activities and the demands on their time. Your job is to be calm, patient, and persistent, and to realize that nothing that a prospect says to you can affect you in any way, because it's not personal. Not long ago, a man came up to me at a sales seminar in St. Louis and told me that something I said at an earlier seminar had changed his life. His story contained an excellent lesson. He told me that one year ago he was on the verge of failing out of his sales career. He hated prospecting because he was afraid of it. He had an inordinate fear of rejection based on previous experiences. Because he hated prospecting, he was doing less and less of it, and his sales were decreasing every month. He knew that it wouldn't be long before he would be let go by his company. He came to my seminar and heard me say, "Rejection is not personal." It hit him like a slap in the face. He realized that his career was going down the drain for no other reason than because of his inordinate fear of calling on people he didn't even know or care about. He was inflicting emotional and financial pain on himself and on his family simply because he had allowed his fears to get the best of him, rather than him getting the best of his fears. That was his wake-up call! He resolved that very day to do whatever it took to excel at prospecting, both on the telephone and in making cold calls. He began a study program. He began listening in his car to audiotapes on prospecting and selling. He read books and articles on prospecting each day. He started earlier every morning practicing his prospecting skills. Within six months, he was not only the best prospector in his company, but his sales had gone up by more than 400 percent. Furthermore, he had recently been promoted to the position of sales manager for his company and transferred to St. Louis with a large salary. He had a development budget for a new office, and he received an override on all his salespeople. In less than one year he had transformed his life and his career by going to work on himself and eradicating the fear of rejection that had been holding him back. He changed his self-image and he now saw himself as an excellent prospector. His new self-image determined the way he thought, felt, and behaved, and his prospects responded to him with greater openness and interest. He realized that it had been his attitude, and his attitude alone, that was determining his results. Fear is and always has been one of the greatest enemies of mankind. It is the greatest obstacle to success in your life and your career. It is both subtle and devastating. It works on you, deep in your subconscious mind, and causes you to see the world negatively instead of positively. Fear makes you interpret events to yourself in a negative way. It causes you to associate only with other people who think and feel the same way. You reinforce each other's fears and beliefs. The cumulative result on your personality and your sales career can be tragic. For you to achieve great success in selling, the eradication of fear as an influence in your life is lob number one. There is an inverse relationship between fear and self-esteem, like a teeter-totter. The greater the fear, the lower your self-esteem. But the higher your self-esteem, the lower will be your fear. Everything you do to raise your self-esteem will decrease the fears that hold you back, and everything you do to decrease your fears will raise your self-esteem and improve your performance. Since all fears are learned by repetition of the fear-inducing event or thoughts of those events, fears are unlearned by repeated acts of courage in opposition to the responses of fear. For example, if you are afraid of cold calling, the way to overcome your fear is to confront it repeatedly until it goes away. This is called "systematic desensitization." You keep doing it until it no longer holds any fear for you. It is the very best and most effective way of developing courage and confidence in any area of your life. As Ralph Waldo Emerson said, "Do the thing you fear and the death of fear is certain." Another way for you to overcome the fear of rejection is to learn to speak on your feet. Certain fears are bundled together, like wires, in the subconscious mind, and the short-circuiting of one fear causes the short circuiting of the others on the same circuit. One of the fears that is bundled with the fear of rejection is the fear of public speaking. Fifty-four percent of American adults rank the fear of public speaking ahead of the fear of death. When you learn to speak on your feet -- by joining Toastmasters International and attending the weekly meetings, or by taking a Dale Carnegie course, for example -- you become more confident and self-assured in your interactions with others on a one-to-one basis. When you become a competent public speaker, you simultaneously become more powerful and persuasive in your prospecting and sales activities. I gave this advice at a sales seminar a couple of years ago. About a year later, a businessman came up to me to tell me how that advice had helped him. He said that when he left the seminar, he had immediately joined a local chapter of Toastmasters and began attending regular meetings. Within six months, he had overcome his lifelong fear of speaking in front of an audience. He worked for an engineering firm in a back-office job, but his increasing confidence came to the notice of his boss. One day, his boss asked him if he would conduct a presentation to the board members of a client corporation on a project they were proposing. He accepted the assignment with a little trepidation, but he prepared thoroughly and then went and gave an excellent presentation. By the time he got back to the office, the prospective client had phoned his boss and told them that the job was theirs, and how impressed they were with the presentation. Now, he told me, his company sends him out to meet with clients at least twice a week. He had received two promotions and his income had increased 40 percent in the last twelve months. He had his own office with a secretary and was included in all senior staff meetings. His career was on the fast track and he had never been happier since he learned to confront his fear and overcome it. It was the turning point in his life. Sales success does not necessarily come from prospecting. It comes from being eager to call on new prospects. It comes from being eager to present your product or service as the solution to their problem. It comes from being eager to show them why their objections have no merit. It comes from being eager to ask them to make a buying decision right now. It comes from being eager to ask for referrals and to look for ways to sell more to the same customer. And eagerness comes from the self-esteem that emerges naturally when you have confronted and eliminated the fear of rejection. Your level of self-esteem will largely determine your level of sales, and how happy, positive, and optimistic you feel. Your self-esteem is determined by how much you like, accept, and respect yourself, by how much you feel you are a valuable and worthwhile person. Everything you do to boost your self-esteem will improve every part of your life. The flip side of self-esteem is your self-efficacy. Your level of selfefficacy is determined by how well you feel you perform at the things you do. The better you perform, the better you feel. And the better you feel, the better you perform. Each one feeds on the other. They are mutually supportive and reinforcing. It is not possible for you to to feel good about yourself and perform poorly, nor is it possible to perform poorly and feel good about yourself. The more consistent your current actions are with the very best person that you can imagine yourself becoming, your self-ideal, the higher will be your self-esteem and the greater will be your self-liking and self-respect. If you consciously and deliberately act in a positive and professional manner, over and over, you will eventually see yourself as being a positive and professional person. You will feel positive and professional in your work with your prospects and customers. Your actions, which are under your control, will generate the feelings and images consistent with them. People judge you by the way you behave toward them. They largely accept you at face value. They form their estimation of you by the way you carry yourself, and by the way you talk and act when you are with them. If you act like a top sales professional, in every sense of the word, people will treat you as if you are one. You can take a top salesperson out of a good territory, put him into a poor territory, and he will make just as many sales in the poor territory as he made in the good territory. You can also take a poor salesperson out of a poor territory and put him into an excellent territory, and his sales will stay at the same level they were in the poor territory. Your self-image, how you see yourself, determines your performance in the present. If you see yourself as a salesperson earning $50,000 per year, then no matter what happens to the economy, the competition, or the company, wherever you go, under whatever conditions, you will sell enough to earn $50,000 per year. Your sales results will have very little to do with what happens to you on the outside. They will be largely determined by what is happening to you on the inside, within you as a person. One of my corporate clients had thirty-one branch offices. One of the offices stood head and shoulders above the others. It led the company in sales results year after year, sometimes outselling the number two office by two or three times. This office was run by an excellent sales manager who hired and trained top people. He was very selective in recruiting. He chose people based on their attitudes and personalities as much as anything else. Over the years, salespeople who had been average performers in other companies or branches became top salespeople within a few months after joining this particular sales office. What was the reason? It was quite simple. The new salesperson was immediately surrounded by winners, by examples of sales superiority and sales excellence. He saw positive, enthusiastic people, coming in earlier, working harder, and staying later. He got caught up in a sense of teamwork and cooperation. He was surrounded by positive, supportive people. Everyone was excited and proud about being among the top people in the top branch. In no time at all, this enthusiasm infected the new salesperson and he or she began acting the same way -- and getting the same results. Self-image modification is the key to unlocking your sales potential. It is the means by which you program into yourself the thoughts, feelings, and behaviors of the best salespeople everywhere. As you change the way you see yourself, your sales results will begin to improve immediately. There are seven ways the top salespeople in every business and industry see themselves, think about themselves, and respond to their prospects and customers. You can think of these as seven steps to enhanced self-image or self-esteem. As you shape and modify your selfimage so that it is similar to that of the best salespeople, you will begin to see improvements in your sales performance faster and more predictably than by anything else you could do. The first and most important quality or self-image, from which all the others flow, is the attitude of self-employment. The word "attitude" in aeronautical terms refers to the approach or angle of attack of an airplane with regard to the horizon. Your attitude with regard to selfemployment is the way you approach your work, your company, your products and services, your prospects and customers, and everything you do. This attitude of being in charge of your own economic destiny is the critical distinction between high performers and low performers in selling and in almost every other field. Seeing yourself as the president of your own professional sales corporation is the natural extension of your accepting total responsibility for the person you are and for everything that happens to you. If self-esteem is the first pillar of sales success, then self-responsibility is the second. The more you like yourself, the more you accept responsibility for your life, and the more you accept responsibility for your life, the more you like yourself. The two support each other, and each is impossible without the other. In our legal system, you can become the president of your own company by simply deciding to do it. You don't need permission from anyone. You don't even need to register your company if you name it after yourself, like "John Jones and Associates." You can then have business cards printed and open a bank account. By making yourself president in your own mind, you take complete charge of your own life. You accept complete accountability for your sales results. You become a completely self-reliant individual, in command and in control of your personal and financial destiny. When you accept complete responsibility for everything that happens to you, you stop making excuses and blaming others. You say, "If it's to be, it's up to me." Like President Harry Truman, when there is a problem, you say, "The buck stops here." You are the boss. You are the final authority. There is no one beyond you to pass it off to. If sales are good, you get the credit. If the sales are poor, you get the responsibility. You "never complain, never explain." The top 3 percent of Americans, in all fields, act as if they "own the place." They look upon everything that happens in their companies as though they personally owned 100 percent of the company's stock. They feel personally responsible for customers, sales, quality, profitability, distribution, and cost-effectiveness. They are totally engaged with their work and with their products and services. Some things in life are optional and some things in life are mandatory. Taking your next winter vacation in Hawaii is optional. You may or may not do it, as conditions permit. But being the president of your own company is mandatory. It is not a matter of choice. You already are. The biggest mistake you can ever make in life is to think you work for anyone else but yourself! You are always selfemployed, from the day you take your first job until the day you retire. You are your own boss. You are on your own payroll. You ultimately determine your own income. You determine the conditions of your work life. If there is anything about your current situation that you don't like, it is up to you to change it. No one else can or will do it for you. Would you like to make more money? Then go to the nearest mirror and negotiate with your "boss." The person in the mirror is the one who determines how well you do in your profession and how much you get paid for it. Here's an exercise for you: On the first day of each month, take your own personal checkbook and write out a check for the amount of money you want to earn that month and date it for the last day of that month. Make it payable to yourself. Sign it. Then, for the rest of the month, concentrate on figuring out how you are going to make payroll, just like a company president. If you have to increase your sales in order to increase your paycheck, your job is to figure out how to do it. As the president of your own professional sales corporation, your current employer is your best client. You have not always worked for your current employer, and the way the economy is changing, you may not always work for the same company. But you will always be working for yourself. You will always be self-employed. By making the decision to go from employee status to being the president of your own personal services corporation, you make the decision to become the primary creative force in your own life. You no longer see yourself as a victim or as a passive recipient of what happens in the economy. You are an active agent. You are in charge. You go out into the workplace and you make your own life and your own living. You sell your services to the highest bidder and you deliver the very best services of which your personal sales corporation is possible. Instead of waiting for things to happen, or hoping that things will happen, you instead make things happen. As the president of your own company, you are in charge of every activity of your business. You are in charge of sales, marketing, production, quality control, distribution, and administration. You are in charge of your own training department, constantly working on yourself to increase the value of what you do so that you can charge more for it in the marketplace. You are in charge of every aspect of your life, both personal and professional. What is one difference between a professional salesperson and a nonprofessional? The professional salesperson, like a doctor, lawyer, architect, engineer, or dentist, has his own library of books and tapes on selling that he continually adds to as his career develops. Nonprofessional salespeople, those who view themselves passively, as employees, or victims of the economy, seldom invest in themselves and, in many cases, have no books or tapes on selling at all. They are waiting for their companies to take the time and spend the money to train them to be better. They don't realize that they are in business for themselves. And in not realizing that they are self-employed, their futures become more limited with every passing year. To sum up, the very first and most important self-image that you must develop is that of seeing yourself as self-responsible and selfemployed, as the president of your own professional sales corporation. From this moment onward, see yourself as completely in charge of everything that happens to you, and if you don't like what's going on, then it's up to you to change it or improve it in some way. The second self-image possessed by high-achieving salespeople is that they see themselves as consultants rather than as salespeople. They see themselves as problem solvers with their products or services rather than as vendors looking for someone who will trade them money for what they have to offer. They do not approach their customers with hat in hand, hoping for a sale. Instead, they approach their clients with the attitude that they are consultants calling on their prospects to help them solve a problem or achieve a goal. Seeing themselves as consultants, they ask questions carefully and listen intently. They focus their attention on understanding the customer's situation so that they can make intelligent recommendations based on what the customer really wants and needs. As consultants, they recognize that they must be experts and authorities in their fields. They invest time to learn their products and services inside and out. They spend many hours familiarizing themselves with every single detail of what they sell, and of what their competitors sell as well. They know the features and benefits, strengths and weaknesses, advantages and shortcomings, of what they are offering. They have excellent product knowledge, which their customers can sense and which gives both themselves and their customers greater confidence throughout the sales conversation. Top salespeople, positioning themselves as consultants, see themselves as resources for their clients. They see themselves and carry themselves as advisors, mentors, and friends. They become emotionally involved in their sales relationships and they are intensely concerned that their products or services be the ideal solution to the real needs of the prospects they are dealing with. They differentiate themselves from their competitors by being more concerned with helping their prospects than they are with selling their products or services. Their customers often feel that they care more about them than they care about making a sale. And it's true. The final element in seeing yourself as a consultant rather than a salesperson, as a problem solver rather than as a vendor of goods and services, is that you take the time to fully understand your customer's situation before you make any recommendations as to what he or she should buy. You do your homework prior to the meeting, and you build on that homework by asking the probing questions that help you understand the customer's needs at a deeper level. You sell by tailoring your product or service in such a way that the customer eventually concludes that what you sell is the ideal solution to his or her current problem. This ability to present your product as the ideal solution comes from your taking the time to understand the customer's business or situation completely before you make any suggestions or recommendations. This is the hallmark of the consulting approach. The third self-image practiced by the top sales professionals is that they see themselves as doctors of selling. They see themselves as professionals, acting in their "patient's" best interests, and bound by a high code of ethics. As a doctor of selling, you follow the same professional conduct and sequence of activities practiced by medical doctors with their patients when you deal with your customers. You do not allow the client to determine your sequence of activities or dictate your sales process. The medical process is the same everywhere. Whenever you go to any doctor, of any kind, for any condition, he or she will follow the three-part sequence of examination, diagnosis, and prescription. Just as a medical professional would never think of treating you without following these three steps in order, you, as a doctor of selling, would never allow a customer to force you to present your product without your going through your three-stage process as well. This is as applicable to selling magazines door to door as it is to selling oil tankers to Exxon. In the examination phase, you ask excellent questions, carefully prepared, in sequence, which are geared to give you a more thorough knowledge of the patient's condition, or the customer's situation. You would not think of proceeding to the second phase until you had done a thorough examination and you were satisfied that what you had uncovered in your examination indicated that a treatable condition existed. The second phase is that of diagnosis. In the diagnosis stage with a customer, you would repeat back the results of your examination and double-check to be sure that the symptoms you had detected were the real symptoms being experienced by the patient. You would ask additional questions to confirm and corroborate. You and the patient would mutually agree that this diagnosis seems to be an accurate description of the condition or problem. Once this mutual agreement has been reached, that a treatable condition exists and that you have identified it accurately, you can move on to phase three. This is the prescription phase, where you show your customer that your product or service is the best available treatment, taking all the factors of the patient's situation into consideration for the ailment that you have diagnosed. You show the customer that this treatment will take away the pain, or solve the condition. You point out the possible side effects and shortcomings in your product or service offering. And you show that, on balance, what you are suggesting is the best of all possible solutions. Professionals who sell to customers the same way that doctors treat patients find that their sales activities proceed far more smoothly and result in better sales in less time. Top salespeople are strategic thinkers. They set clear goals for what they want and they develop organized plans of action to attain it. They think before they act, and then they act decisively. They plan their work and work their plan. They decide in advance exactly how they are going to get from where they are to where they want to go. Nonprofessionals throw themselves at the marketplace very much the way a dog throws itself at a passing car, barking and running along frantically, consuming a lot of energy, and accomplishing very little. But this is not for you. As a professional, you take the time, on weekends, or during the evenings, to think about how you are going to accomplish your sales objectives. You know exactly what you are doing every minute of every day. You have a plan for the week, the month, and the year. You know how much you are going to earn in a given period and how much you are going to have to sell to earn it. You know where your prospects and customers are going to come from, and you have a plan for getting them. A person with a clear blueprint for sales success, covering every aspect of running his or her own sales business, is far more relaxed, confident, and capable than a person who feels that he or she is "too busy" to plan their activities in advance. When you have a good plan, you have a track to run on. Short-term setbacks and disappointments don't bother you. You take the long view. You are more objective and able to detach yourself from any single call, prospect, or sale. You are able to work steadily, systematically, without haste or waste. One great benefit of strategic thinking and planning is that engaging in them raises your self-ideal and improves your self-esteem. The more you are focused and concentrated on achieving clear, written goals, the happier you will be with yourself and your career. A key quality of top salespeople is that they are intensely result-oriented. In the Gallup Organization's study of successful men and women in America, reported in the "Great American Success Story," the researchers found that the most respected and esteemed Americans, in all fields, were known by their friends and colleagues as being very result-oriented. They were the kinds of people that could always be counted on to do the job properly, and on schedule. This is the way you should see yourself as well. Top salespeople have two qualities, empathy and ambition. The quality of empathy causes them to be sensitive to the best interests of their customers. The quality of ambition causes them to be focused on making the sales expected of them. And they manage to keep these two qualities in balance. They are both concerned about the customer and concerned about the sale. People who fear rejection too much become so overly concerned with not offending the customer that they avoid asking for the order. People who care only about making the sale often offend the customer and end up losing it. Successful salespeople keep their eyes on both balls at the same time. Intense result-orientation requires that you use your time extremely well. You must make every minute count. You must carefully analyze and separate your high-value prospects and customers from those of lesser value. You must discipline yourself to spend more time with the prospects and customers who represent the greatest potential return on time invested. To develop the self-image of intense result-orientation, you must always remember that your primary job is to sell your products or services and to keep your mind focused on that task in everything you do. Top professional salespeople see themselves as capable of being the very best in their fields. They have high levels of ambition and their role models are the very best people in their industries. They identify with the most successful salespeople. They read their books, listen to their tapes, and attend their seminars. In their companies, they spend time with the best people and ask for their advice on books to read, tapes to listen to, and things to do. High self-esteem triggers the desire to be better and better. A person who really likes himself sets excellence as his standard. He is not afraid to shoot for the stars. He looks at the very best people in the business and he thinks every day about how he could be like them. He then backs his ambitions and aspirations with continuous work on himself and on his profession. The very act of thinking of yourself as capable of being one of the best salespeople in your industry improves your overall self-concept and boosts your self-esteem. Psychologist Nathaniel Branden calls self-esteem "your reputation with yourself." When you set high standards for yourself, your reputation with yourself improves immediately. You like and respect yourself more. You believe yourself capable of greater accomplishments, and your sales performance improves on the outside as your self-image improves on the inside. Earlier in this chapter, I pointed out that in every large sales organization there are people who earn $25,000 a year and others who earn $250,000 a year or more. It's important to realize that the person earning $250,000 was once earning $25,000 as well, until he or she made a decision to go all the way to the top. And that decision was the turning point in his or her life. It's the same with you. The starting point of becoming a top salesperson in your industry is your making an unequivocal, do-or-die decision that you are going to be the best at what you do. That is your number one goal. That is where you are going and your decision to be the best then dictates what you will do each day to achieve it. You recognize that excellence is a journey, not a destination. Once you have made that commitment, you back it with persistence and determination and work on it continuously. The seventh step to building a better self-image and improving your sales performance is to adopt the Golden Rule mentality. The Golden Rule says, "Do unto others as you would have them do unto you." The Golden Rule mentality in sales says simply that you should "Sell unto others as you would have them sell unto you." What does this mean? Aren't there all kinds of different personalities that require different approaches and techniques? Well, yes and no. Practicing the Golden Rule in selling simply means that you sell with the same honesty, integrity, understanding, empathy, and thoughtfulness that you would like someone else to use in selling to you. If you would like a salesperson to take the time to thoroughly understand you and your situation before making a recommendation, you do the same thing with your customers. If you would like a salesperson to give you honest information to help you make an intelligent buying decision, you practice the same with your customer. If you would like a salesperson to be thoroughly knowledgeable about the strengths or weaknesses of his or her product or service, and that of his or her competitors, then you do the same with your product or service and your competitors. Perhaps the most important part of Golden Rule selling is the emotional component contained in the word "caring." Top sales professionals care about their customers. They care about themselves, their companies, their products and services, and they really care about helping their customers make good buying decisions. If you think about the very best salespeople you know, you will recognize that they are caring individuals. If you think about your very best customers, you will recall that these are invariably people you care about, and who care about you. When you think about the people you buy from, you will recall that they seem to care about you more than the average. In every part of your business life, you will find that the significant people all have the common denominator of caring as part of their character and their personalities. Only a genuinely honest person can be caring. Only a person with high self-esteem and self-acceptance can reach out and genuinely care about the well-being of others. Only a person who really cares about his or her customer will take the time to thoroughly prepare prior to every meeting. Only a person who really cares about his or her company will take the time and make the effort to be thoroughly knowledgeable about what the company does and how its resources can help customers satisfy their needs. Only a person who really cares about his product or service will take the time to study it from every angle so that he is thoroughly prepared to give good advice when the time comes. Seeing yourself as a thoroughly prepared, completely competent, intelligent, warm, and caring sales professional will enable you to perform at your best in every situation. You will have the mind-set of the top salespeople in every industry, and you will get the same results. Eighty percent of your sales success will be determined by what is going on in your mind. It will be determined by the way you think about yourself and by the way you feel with regard to yourself and your profession. By improving the way you think about yourself and your capabilities, you improve your performance, sometimes overnight! Your self-concept, the master program that controls everything you say or do, is complex and multifaceted. It is affected by every suggestive influence in your world, by everything that you think, feel, see, hear, read, touch, taste, and the people and influences around you. It is in a constant state of evolution, under your own direction, moving you either toward or away from your goals and aspirations. You must therefore take complete control of your own inner development to make sure you are moving in a direction of your own choosing. By accepting complete responsibility and seeing yourself as the president of your own professional sales corporation, you take charge of your thinking, your emotions, and your future. You become the primary creative force in your own life. You become proactive rather than reactive. You make things happen rather than being at the mercy of things that happen. When you see yourself as a consultant, you carry yourself with a high level of competence and professionalism. Your customers will then accept you at your own valuation. You will sell at a higher level and you will sell more of your product or service, easier than you have before. Above all, your customers will respect you more, and you will like yourself more as well. As a doctor of selling, you see yourself as a thoroughly trained professional, following a specific sequence of examination, diagnosis, and prescription with each prospect. You carry yourself with confidence. You always act in the best interests of your customers and your customers know it when they deal with you. When you become a strategic thinker and planner you know what you are doing and why every minute. You know exactly how much money you intend to make and exactly what mix of sales you will have to make to earn it. You feel very much in control of your activities and your career. Because of your intense result-orientation, you never take your eyes off the ball. You know that your job is to make sales and to bring in the orders. You make every minute count and you measure the value of everything you do against the sales results that are expected of you. Your consistent sales performance makes you feel like a winner and boosts your self-esteem at the same time. You see yourself capable of being among the very best salespeople in your industry. You emulate the behaviors of the top salespeople around you. You act on the outside as if you were already an outstanding sales professional on the inside, and as a result, you get continually better at everything you do. Above all, you practice the Golden Rule in selling. You treat your customers the way you would want to be treated if you were a customer. You focus on helping them solve their problems or achieve their goals. You really care about them, and they sense it. As a result of these ways of thinking, you mold and shape your self-image so that it is the same as that of the most successful and highest paid salespeople in every industry. You see yourself the way the top people do. This is the psychology of selling. Brian Tracy is Chairman and CEO of Brian Tracy International, a company specializing in the training and development of individuals and organizations. He is the top selling author of over forty-five books that have been translated into dozens of languages. Brian is happily married and has four children. He is active in community and national affairs, and is the President of three companies headquartered in Solana Beach, California.